Mustard greens, Arugula (so peppery it almost hurts), Kale, Radicchio and a beautiful round green called Tsatoi that my kids can't get enough of! 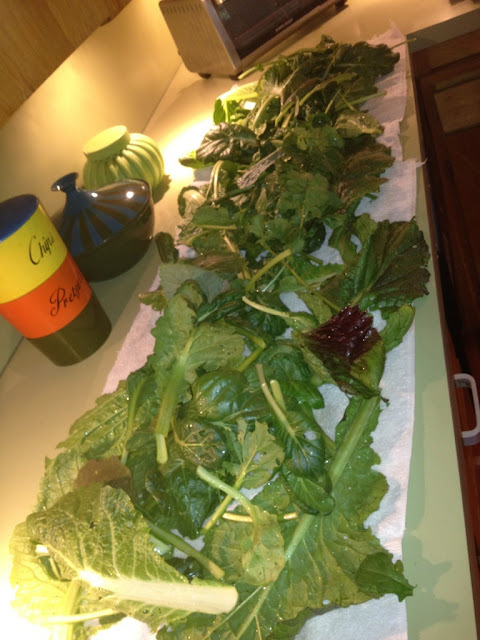 There is NOTHING like fresh greens straight form the garden. They literally bounce with vibrancy. I've been throwing the smaller greens in soups and salads and, per Andrea's suggestion, lightly tossing the kale and mustards in salt, pepper and a little olive oil and roasting them into chips. YUM. The cauliflower, cabbage and broccoli are starting to form and we still have lots of eggplant and beets on their way. All are welcome to enjoy the harvest. Just send me an email and I'll hook you up!